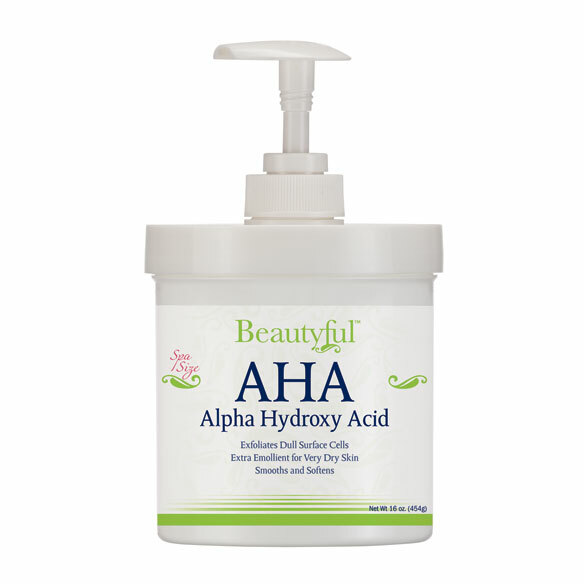 Beautyful™ AHA Alpha Hydroxy Acid Cream, 16 Oz. In a “more is more” 16 oz. spa size, this generous, convenient pump jar lets you enjoy the best in skincare at a fraction of the cost. Dual-purpose AHA alpha hydroxy acid cream deeply hydrates dry skin, while exfoliating surface cells for smooth, even and radiant-looking skin. Compare at $60! Seemed to be what I wanted. It helps my skin and makes it smoother. I love it. thank you. To promote cell turnover, hopefully plumping skin. DOSE THIS A H A TIGHTEN YOUR PORES IN YOURS SKIN? BEST ANSWER: Thank you for your question. This item is designed to hydrates dry skin, while exfoliating surface cells for smooth, even and radiant-looking skin. We hope this information will be of help to you. What percent of Alpha Hydroxy Acid does this product contain? BEST ANSWER: Thank you for your question. There is no fragrance added but some of the ingredients do have a scent. We hope this information will be of help to you.